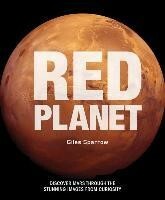 Mars has always dominated our imagination and now we are discovering more and more about the reality of the Red Planet. Lush and authoritative, this fascinating guide brings Mars to vivid life through incredible images (some never before published) taken from the Mars rovers, manned spaceflights, the International Space Station, and the Hubble telescope. “Red Planet” examines the scale of Mars, what we understand about its inhospitable climate, and how our newfound knowledge will inform humanity’s attempts, finally, to build long-term colonies there.